alaTest has collected and analyzed 103 reviews of Sony NEX-VG20. The average rating for this product is 4.2/5, compared to an average rating of 4.1/5 for other Camcorders for all reviews. Reviewers are impressed by the design and durability. The size and image quality are also appreciated. The price and portability get mixed opinions. The color and zoom get negative views. We analyzed user and expert ratings, product age and more factors. 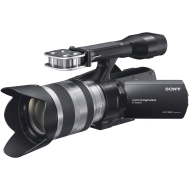 Compared to other Camcorders the Sony NEX-VG20 is awarded an overall alaScore™ of 88/100 = Very good quality. Position of focus button and manual dial. Balance and weight. Slow storage of stills. Fast AF with E mount lenses .